Leah and Travis met at church. Travis was a guitar player and singer in the band. During the Christmas Eve service, Travis claimed he had to work, but then he showed up on stage. The pastor pulled Leah up as well and that was when Travis got down on one knee. Leah’s favorite memory from the big day was just before she walked down the aisle. She stood with her father, holding his hand and just taking everything in. All the butterflies and all her excitement in taking that first step were incredibly meaningful and sweet. Pink worked not only for the girls, but also for the men and their gray suits. 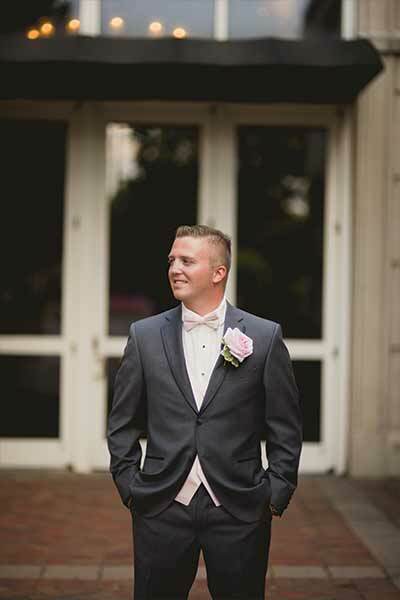 Leah found ways to incorporate the color into her wedding dress, the flowers, the bridesmaids’ gowns, and the groomsmen's vests. For some extra flair, their cake was embellished with rhinestones. And because there are never enough sparkles, they finished off the day with a sparkler exit and a fancy Corvette getaway car. What really made the wedding unforgettable though were the bridal party and guests. Being able to celebrate their love with so many people they cared about made their big day that much more amazing. Make sure to see more of the Smith Wedding on page 118 of bridebook! Jessica and Brandyn met back in high school, and they’ve been together through all stages of life ever since. After seven years, Brandyn managed to surprise Jessica with his proposal. He’d told her he was out of town on a business trip, but during that week he asked her to run over to his dad’s house to pick something up for him. She was directed to the garage, where they’d had their first kiss, and found him waiting on one knee. Brandyn even had an engagement party planned with all their friends and family. Jessica’s favorite memory of her big day was walking down the aisle. Her stepfather walked her to the top of the aisle and then handed her off to her father, but not before both men shared a hug. It meant a lot to Jessica to see both her dads in solidarity before she married her best friend. The theme of the wedding was the Great Gatsby. Jessica had a 1920’s styled dress from BHLDN, and they strung twinkle lights in the ceremony and reception space. Gold candelabras and accents tied the theme together, but the real showstopper was the vintage 1920’s Rolls Royce getaway car. 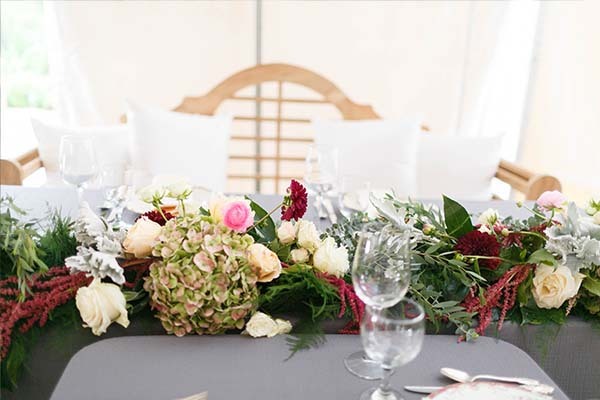 They used flowers for most of their decorating, combining soft blush colors with deep burgundy and rich green accents. 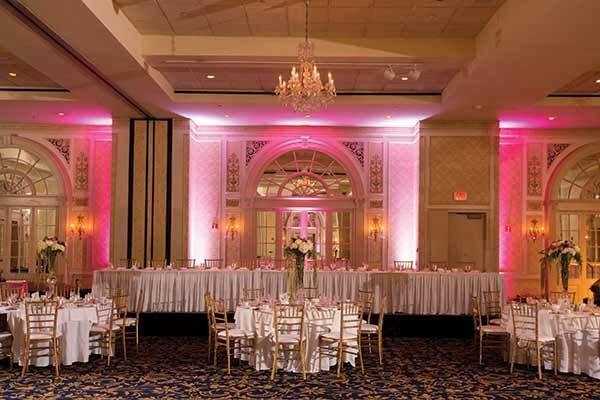 The three-foot gold candelabras and short, round gold vases were used together to create tiered centerpieces. The sweetheart table was embellished with a green garland and mercury glass votive candleholders. Food was served family-style, and it did not disappoint. They served root vegetables in hollowed-out baby pumpkins, dishes seasoned to perfection, and an incredible presentation. The cake was even created using Jessica’s grandmother’s pound cake recipe. Part of what made their wedding so unique was because of Jessica’s parents. Both of them are in the wedding business, and they spent over a year planning the perfect outdoor wedding. Jessica and Brandyn also wrote their own vows, which really helped to personalize the day and make it their own. Make sure to see more of the Turley Wedding on page 88 of bridebook!